oard SSC examine can apply their re-scrutiny result. Here we include all about information about SSC Exam Result Re-scrutiny Application Online 2019. Application Fee: 125 Taka for one subjects. We are also published SSC Exam Result Re-scrutiny result. The education board of Bangladesh has been published HSC Board Challenge Exam Result 2016. You can see the result also our site. We are published SSC, HSC and Alim board challenge exam result. You can see all kinds of Result in our site. So, stay with us. We are give you information up to date. This Year SSC Exam Result Re-scrutiny result 2019. Bangladesh Education Board published a notice for the student of secondary school certificate examination 2019. In this notice they are announce a change to apply SSC result for re-scrutiny. According to their notice the board challenge apply system will be start on 12th May and it will be end on 18th May 2019. The student who are not satisfied their published result they are apply for re-scrutiny result. The result will be published 8th June 2019. SSC Exam Result Re-scrutiny result 2019. HSC exam board challenge result will be published 6th or 7 June in this year. When it will be published you can see it here. Application Fee: 125 TK. for every subject. Now you can collect SSC Exam Result Re-scrutiny result 2017. Bangladesh Education Board has been published Secondary School Certificate (SSC) exam result on 11th May 2016. In this time, if any student think the result is not accurate on her expectation. Then he or she can apply for SSC re-scrutiny result by SMS. Here we upload a picture that contains about all information for SSC re-scrutiny result 2016. See and read this rule and instruction carefully. After reading all instruction you can apply for the Re-scrutiny result on SSC. It is a way to challenge your result by education board. It is also known as Khata Challenge Result. At first open your write massage option on your phone. Remember that your SIM card will be teletalk must. After open your write massage option simply type. 1st SMS: RSC<space>First 3 letter of your board name<space>Roll number<space>subject code and send it 16222. After sending your 1st SMS you get a reply SMS by teletalk. They are provide a PIN number and inform you how much amount they are deduct on your account. 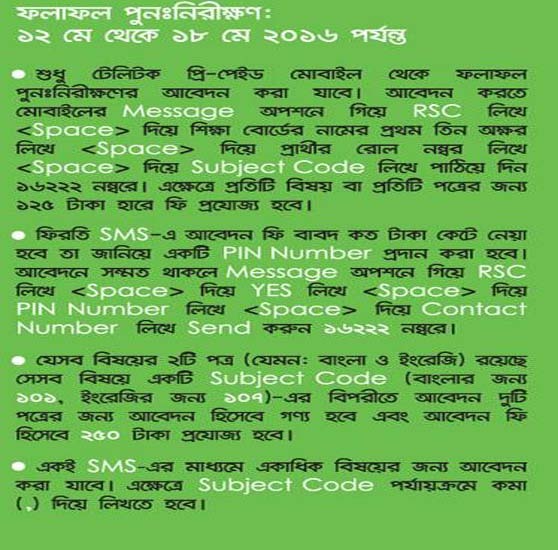 2nd SMS: RSC<space>Yes<space>PIN Number<space>Your Contact Number and send it 16222. Remember, If you apply for Bangla and English Subject then you must be paid 225 TK. Please use comma in subject code number if you are apply more then one subject. If you need more information then go to Bangladesh Education Board official website. If you think any of the information of this post are wrong then inform us by email or Facebook Page. You can also follow us our Google Plus Account. Thanks for visit our website. Here also leave a reply for your survey. Know more about this SSC visit Wikipedia web page.